Last night Carlo Traversi and Jamie Emerson repeated Trice, a significant event in bouldering history. However the asterisk factor emerges as both climbers used a foot high and left of the starting holds. If historical specificity is an issue, as Jamie mentions regarding the starting holds, the picture that I posted below shows Holloway tackling the holds straight on and hence the problem has still not been repeated as Holloway did it. What is interesting to me is the way that the original problem is like a work of art in a particular way. The original really is never repeatable, never really rediscoverable. 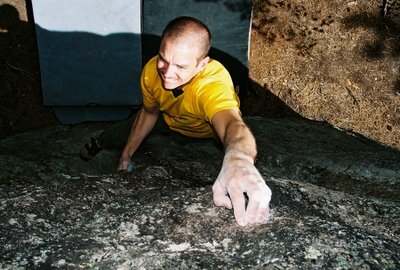 Any of us who do the problem in 2007 or later are ultimately climbing something else, an idea in our heads, the essence of which vanished on the day that Holloway climbed his problem. I sense the same can be said of all climbs or ascents of climbs, that something is brought into the world that quickly vanishes and which all the cameras in the world can never actually capture. If climbing is a quixotic quest, surely trying to retrace the steps of a boulder problem of 30 years ago is the most extreme example. There will be a mini-media frenzy about all this I'm sure but it feels to me like the participants are chasing something that disappeared long ago. To paraphrase someone,"Holloway has left the building". Now is the time to find our own legends while respecting those of the past. I've enjoyed reading everyone's take on this problem. It is interesting how everyone sees things a little differently, but is equally psyched. One thing is that I would add that I DO NOT see Trice as "gross" or "contrived" as Holloway put it. It starts on obvious holds and has one rule (go RH into the pocket). Jim never seemed to make a big fuss about other feet and different hand sequences not being fair game. He was gracious about the repeats ... hopefully, the legend of Holloway will continue to grow.